2. (a) (i) Define dynamic viscosity and give the mathematical formula for Newton's law of viscosity. (ii) How does kinematic viscosity differ from dynamic viscosity? (b) Explain why viscosity is an important property in Fluid Mechanics. (c) Name three classes of non-Newtonian fluids and explain how their viscosity is affected by factors other than temperature. (d) What is the main difference between an ‘ideal' fluid and a ‘real' fluid? (ii) Determine the second moment of area of this shape and hence its radius of gyration about the axis a-a. 4. 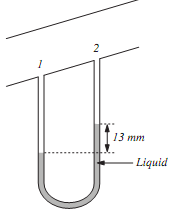 (a) What is the formula for calculating the pressure due to the height of liquid? (b) Name two devices which make use of this formula when used for pressure measurement. (c) (i) In the situation, below calculate the pressure difference between points 1 and 2 for the flow of a gas within the pipe. The liquid present is mercury whose density is 13 560 kg m-3. (ii) The liquid is now replaced by a new liquid whose density is 2100 kg m-3. If the pressure difference remains constant, what will be the new difference in level between each limb? (iii) What is the advantage of changing the liquid? 5. A concrete vessel containing water has a square seal gate, hinged at the top, blocking off the outflow of a large reservoir as shown below. (i) Calculate the total moment about the hinge of the seal gate. 6. 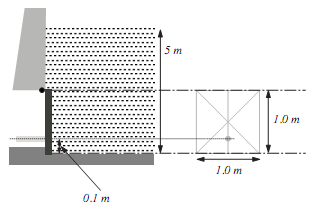 A storage tank has the cross-sectional shape shown below and is of 1 m breadth. 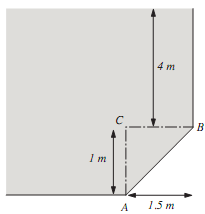 Calculate the resultant force acting on the inclined surface AB and its point of action. The density of the liquid is 900 kg m-3 and take g = 9.81 ms-2. 7. (a) Describe the operation of a device which uses hydraulic pressure. (ii) the pressure within the hydraulic fluid. 8. The diagram shown below represents a process for which a pump and associated pipe work require to be correctly sized. The liquid is to be pumped from the underground storage vessel which is vented to atmosphere (assume 1 bar pressure) to a pressurised container supported some distance above ground level. The pump is sited at ground level and must be capable of delivering 0.01 m3 s-1 with a maximum velocity of 1.8 m s-1. 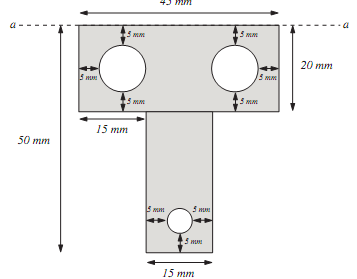 (a) Calculate the theoretical diameter of the pipe; the nominal pipe diameter chosen from the table; and the actual average velocity in the nominal pipe. fluid (?ρ) × gravitational acceleration (g)]. Determine the nature of the relationship between these variables. 10. 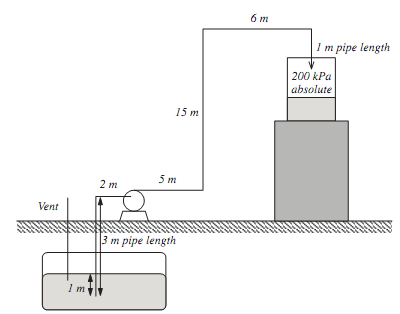 (a) Water (density 1000 kg m-3) is maintained at a gauge pressure of 4 MPa in a horizontal pipe of diameter 100 mm. It is passed through a nozzle of diameter 15 mm which discharges a horizontal jet into the atmosphere. If the frictional losses reduce the theoretical discharge velocity by 6% in this process, calculate the actual velocity of the jet and its flow rate in kg s-1. (iv) the power generated by the impact in the horizontal direction. 11. (a) Distinguish, with the aid of simple sketches where appropriate, between the construction, operation and applications of the Pelton wheel, Francis turbine and Kaplan turbine. (vi) height of runner blade at inlet and outlet. 12. A process requires the precise control of the flow of a fluid to a reactor operating at 100 bar pressure (1 bar = 100 kPa). The flowrate may need to change to match the required reactor output. The flow should be relatively non-pulsating. (i) Suggest a suitable pump for this duty. Give reasons for your choice. (ii) Describe, with the aid of a suitable diagram, the construction and operation of your chosen pump. 13. It is proposed to pump 1500 m3 of a liquid (density 1100 kg m-3) each day through a total head of 10 m (including all losses) by using either a centrifugal pump or a reciprocating pump. The centrifugal pump discharges 2.0 m3 min-1 when driven by an electric motor supplying a power of 5 kW. The reciprocating pump has a discharge rate of 1.75 m3 min-1 when driven by an electric motor supplying 3.5 kW. (a) Calculate the efficiency of each pump. (b) If electricity costs 8p per kWh, select the most economical pump and determine the cost saving over 300 days of operation. (c) State two other factors which should be considered before a final choice of pump is made. (i) Name any incongruent melting intermediate compound(s) present. (j) Locate and draw a square around all congruent melting equilibria. (k) Label all the two-phase fields.